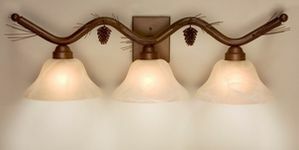 Vanity Lighting is a great way to infuse some rustic flair into your bathroom or vanity area. LodgeCraft carriers rustic and lodge style vanities from Steel Partners, Colorado Rustic Lighting and Meyda Tiffany, to name a few. All of our rustic vanity manufacturers craft the highest quality lighting, to ensure long life and lasting beauty. Whether you seek a 2, 3, or the 4 light varieties, we have just the right lighting for your needs. For over 20 years, LodgeCraft has been the preferred source for lodge style vanity lighting. Nature Bear 4 Light Vanity - 24"
Nature Moose 6 Light Vanity - 36"